Failure. It’s often an opportunity in disguise. And disguises are often misinterpreted. 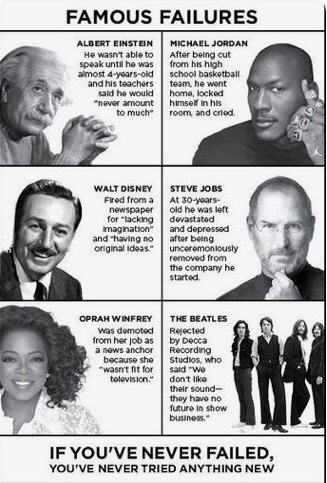 Albert Einstein, Michael Jordan, Walt Disney, Steve Jobs, Oprah Winfrey, The Beatles and many more all experienced challenges that looked like failure. Millions of Trademark opportunities appear incognito. They do not look Artificial. Their very existence look like doom and gloom. But see them for what they are-a chance to reach higher. Today, if things are going awry, look at them for what they are…..opportunities to succeed. Previous Previous post: Being Micro Managed?